Mrs. Morris (no known first name) is a physical-education teacher at Lawndale High, as well as the track team coach and (it appears) the cheerleading coach. Morris appears in the episode "See Jane Run" and has two photos in "The Daria Database" and a non speaking appearances in "Lucky Strike" and "Life in the Past Lane". She's been at Lawndale High for over a decade, and taught Penny Lane and Summer Lane before her. She has contempt for both girls and the Lane's in general, and deliberately targeted Penny when she was teaching her: "I taught her a thing or two about the American competitive spirit." which prompted Jane to reply "You sure did. That's why she's spent the last ten years out of the country." 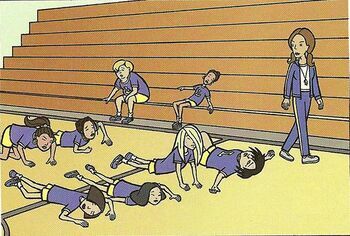 A typical class, from "The Daria Database"
"Database" has a photo of a typical lesson: the entire class are half-dead on the floor, and Morris is walking past them with a satisfied expression. A photo of the Lawndale High staff room has her blowing her whistle to try and break up Janet Barch's beating of Anthony DeMartino. She would later join the school's union strike, and go on to watch Charles Ruttheimer III seemingly dying at his magic act with amusement. 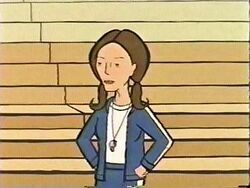 Morris also appears in Daria's Inferno where she offers her whistle, to keep the football players and cheerleaders at bay in Lawndale High. Morris has often been portrayed in a negative light in fanfiction, in tune with her antagonistic portrayal in See Jane Run. "Do you think you can be all that you can be?" Ring of Champions, of the the John Lane series, by Richard Lobinske. See Jane Spike by The Angst Guy, where she's a tyrannical figure of terror forcing the characters into a volleyball game. Morris appeared in Big Sister's Great Adventure by Wouter Jaegers where she's put in a much friendlier light, joking around with Mack about still beating the track team and Cheerleaders into shape before wishing him happy holydays and remarking how pleasant it was to see him again. She also appears earlier in the story as Rachel Landon signs up for the Cheerleading squad. Ms. Morris also appeared in Wouter Jaegers' Keeping Track of Fantasies, in a flashback of her verbal battle against Jane. And as Evan's lover in a not so pleasant figment of Jane's imagination.